“This limited edition print is an enhanced and embossed offset lithograph on high-quality rag paper with deckled edges”. Definitely sounds impressive but seriously, what does it really mean? The process of converting an original painting into a limited edition print is both challenging and fascinating. Duplicating the color and clarity of Shag’s original work across a number of copies takes a lot of effort and is surprisingly expensive. Previous posts covered the creative process and the numbering of limited edition prints. 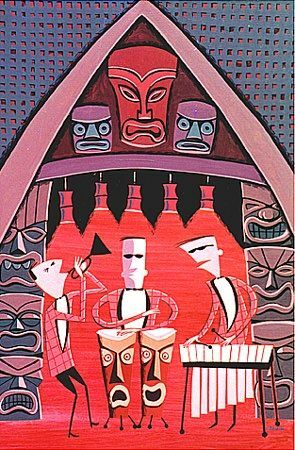 This post focuses on the different printmaking processes that Josh Agle has employed to reproduce his work. Shag creates original paintings using acrylic and vinyl paint on wooden board or canvas. His usual medium is tablex, a high-density fibreboard panel manufactured from eucalyptus wood with a smooth side and a rough side. 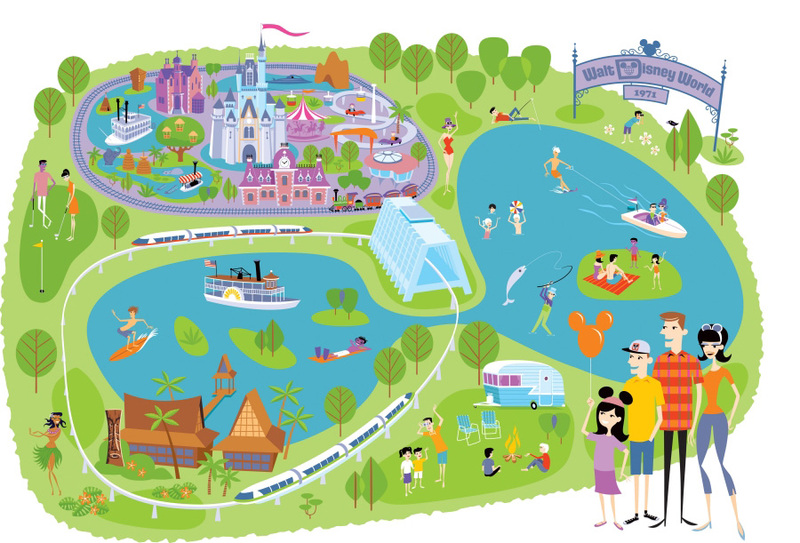 To satisfy the collectors market, some of these are turned into limited edition prints in edition sizes of up to 500 copies. The process used to create the prints has varied over the years for several reasons including cost, quality and quantity required. The first reproductions of Josh Agle’s work were the three offset lithographs prints produced by Martin McIntosh’s Outré Gallery Press for the Dial H for Hipster Exhibition in 1999. The prints were The Boardmeeting and Three Musicians (both in editions of 500) and the triptych Departure: Idlewild, Stopover: Borneo, Arrival: Ape City (in an edition of 150). 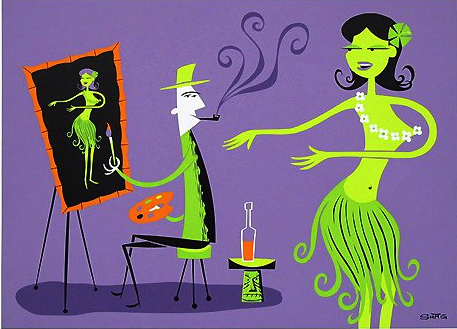 Although successful, the process was not ideal for recreating the deep hues and crisp lines of Shag’s work and only a few limited-edition prints have been produced since using this method such as the poster style 2013 print Lunch with Shag at Trio Restaurant and the photograph based 2016 print Hukilau Mystery Girl. Offset lithography is the standard commercial printing method used to recreate work and is also known as poster printing or offset printing. An image is put onto a thin metal plate which is dampened by water and ink by rollers on the press. 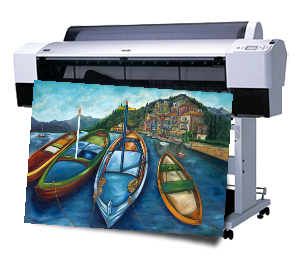 The oil-based ink adheres to the image areas and the water to the non-image areas. The inked area is transferred to a rubber cylinder (known as a blanket) and then onto the paper as it passes around the cylinder. 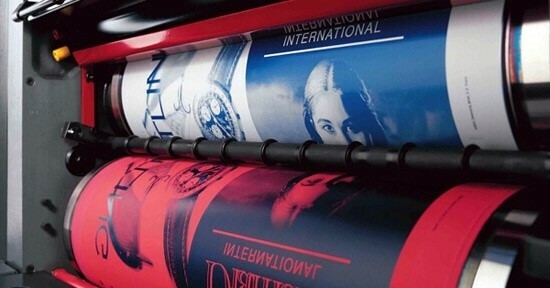 The process is called offset as the image does not get transferred directly from the plates to the paper but instead is offset or transferred by an intermediary. Individual sheets can be fed through the process, or in web offset printing large rolls of paper are used and trimmed afterward. Offset printing is low-cost and is used to produce high-quality images and photographs. 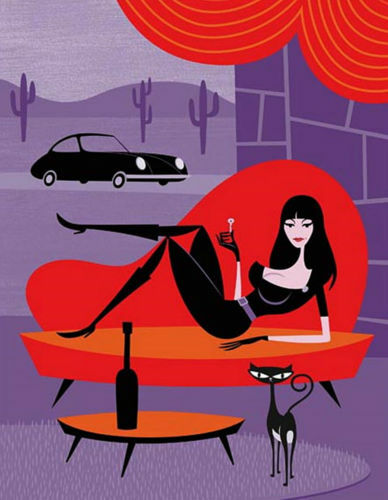 The majority of Josh Agle’s limited edition prints are produced using serigraph printing. The additional color depth, saturation, density and texture are a perfect match to Shag’s painting style. 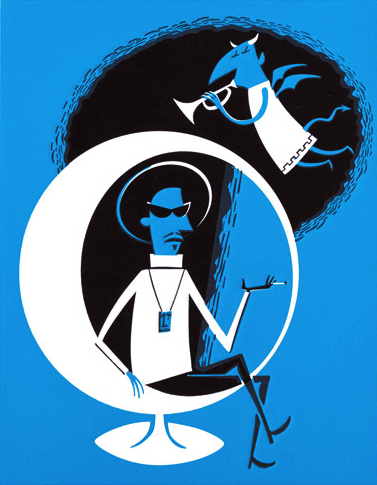 Shag collaborated with Copro/Nason Gallery owner Douglas Nason to produce the serigraph print Leteeg Tribute from the original The Black Velvet Painter painting for the Edgar Leeteg Tribute Show. 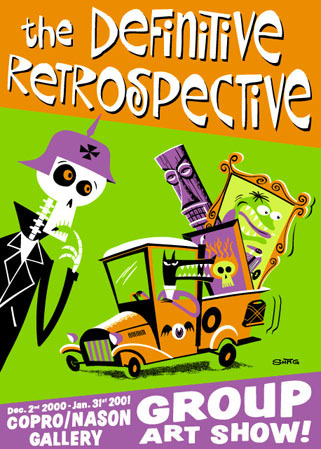 The quote for the five-color serigraph was unexpectedly high so Shag painted The Incredible Cargo, a print for The Definitive Retrospective to gang with the Leteeg Tribute to reduce costs. 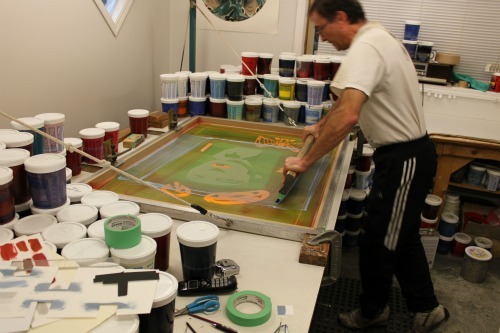 The term serigraph printing is used interchangeably with silk screening, screen printing or serigraphy. In this stencil-based printing process, ink is forced through a fine screen onto end media such as paper, canvas or cloth. Screens were originally silk but are now finely woven nylon or polyester stretched over a wood or aluminum frame. Areas of the screen are obscured by the stencil so that ink squeegeed evenly through the open spaces onto the paper below. A different screen is used for each color in the print, giving much greater color saturation, density and texture. This hand drawn process is labor intensive as the paper must dry on racks between each screen. 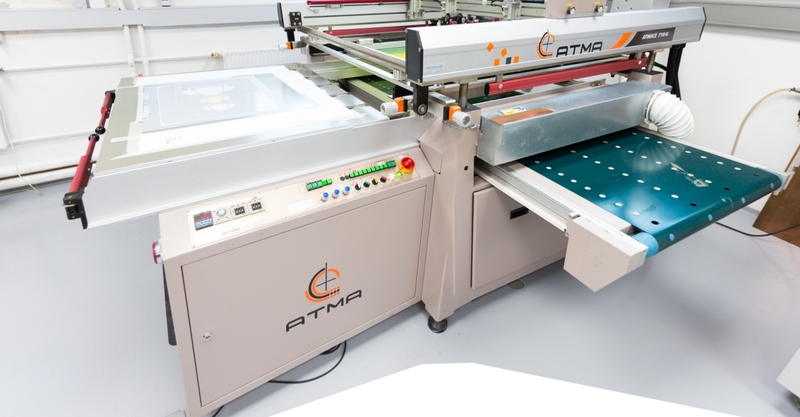 Machines are now available for screen printing but the manual process is far more common. 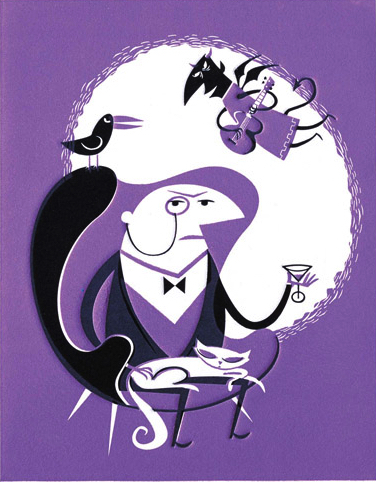 Josh Agle released his first commercial etchings in 2001 with the four prints in the Baron Suite – Baron Von Oben, Gustav, Kitty Q and Mombassa Jones. 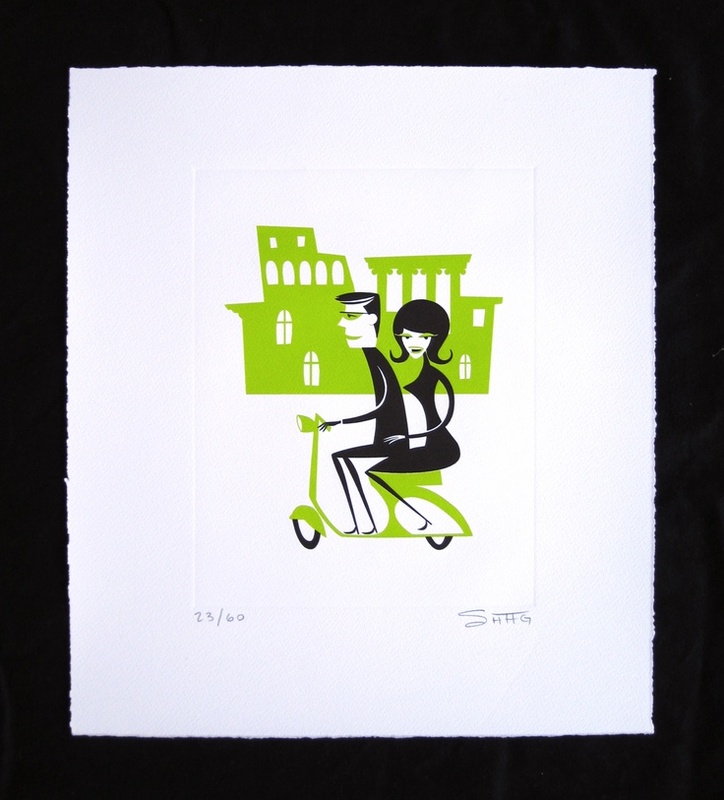 These two-color etchings were released in a limited edition of just sixty pieces each. 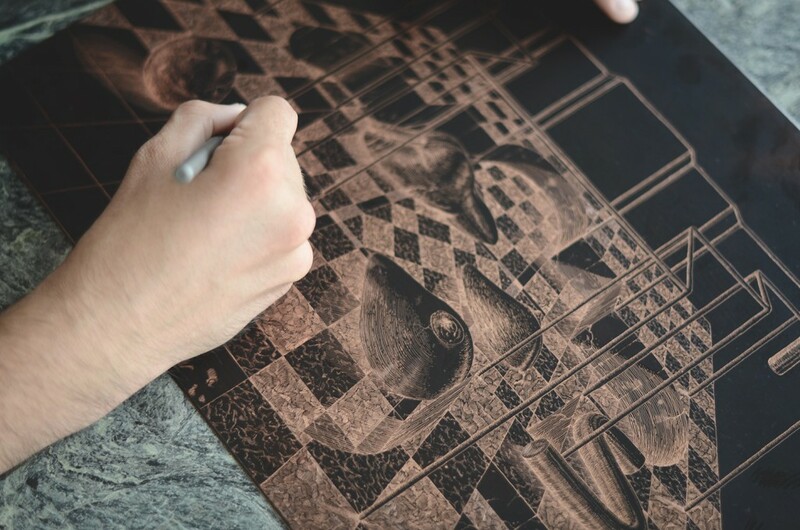 Etching is a printmaking technique where acid is used to incise lines in a metal printing plate which then holds applied ink to form the image. 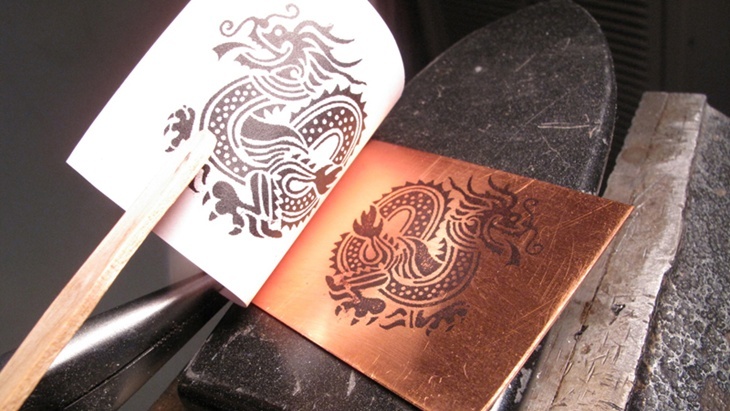 In the traditional etching process a copper plate is covered by an acid-resistant ground in which lines are drawn through to expose the metal. The plate is immersed in acid so the exposed metal is “bitten” to produce incised lines. The resist is then removed and ink applied to the plate but wiped from its surface leaving it within the incised lines. The plate is then pressed against (often dampened) paper and passed through a printing press to transfer ink from the recessed lines. 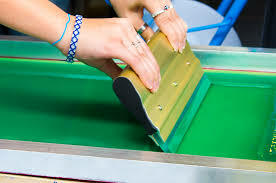 Etching, like engraving, is an intaglio technique; meaning indents or incisions are made onto a plate which holds ink when wiped across the surface. 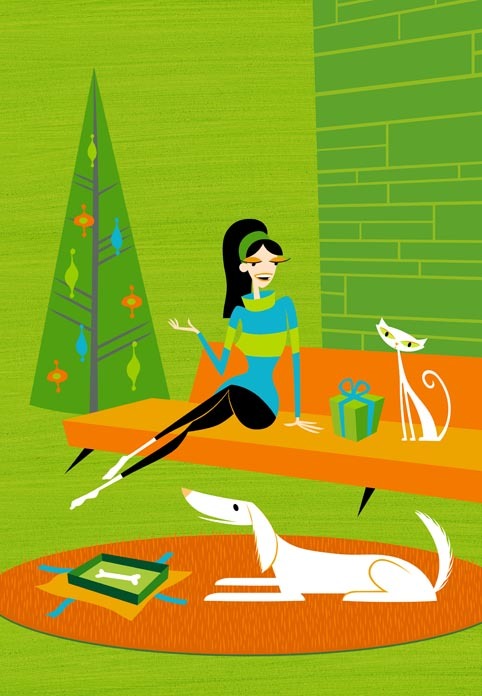 Shag’s first Iris print was Paws Christmas which was released to support a local charity in 2004. This was followed in 2007 by Strings of Paradise, in 2008 by Key To The Carrera, and finally in 2010 by I Author My Own Disaster. 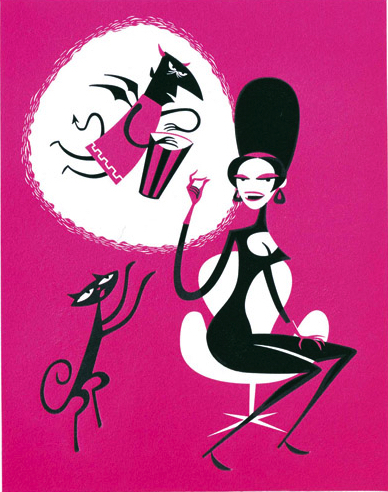 Shag’s four Iris prints were printed on 255gm Somerset velvet-enhanced paper using 75 Epsom inks. 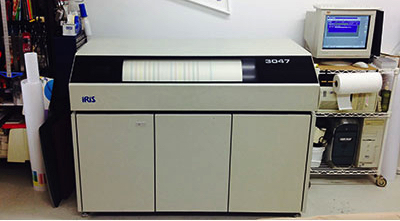 Iris Graphics introduced a large-format high-quality color inkjet printer in 1985 called a Iris Printer. 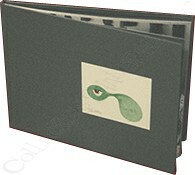 It was designed for pre-press proofing but is widely used in fine art reproduction. 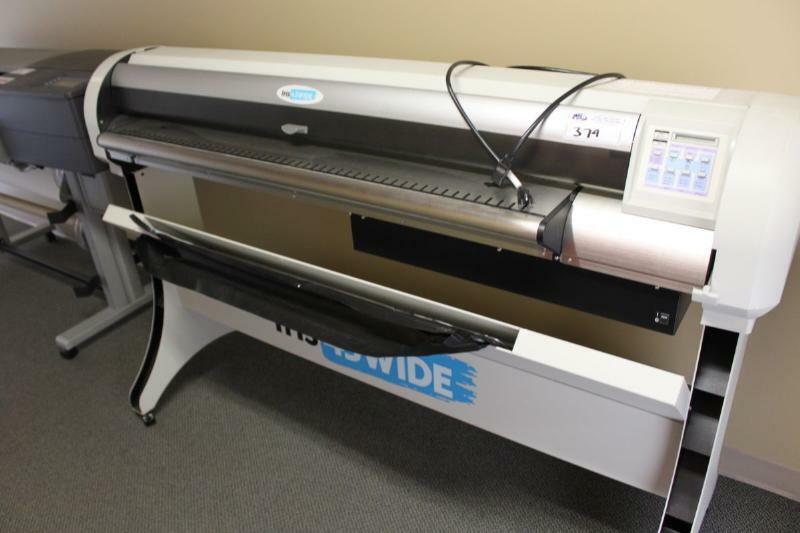 The Iris model 2044 from 1985 can print up to 34” by 44” with the smaller model 3024 following in 1987 and capable of printing 11” by 17”. Following a series of buyouts the Iris product line is owned by Kodak and has now developed into the Veris printer line. 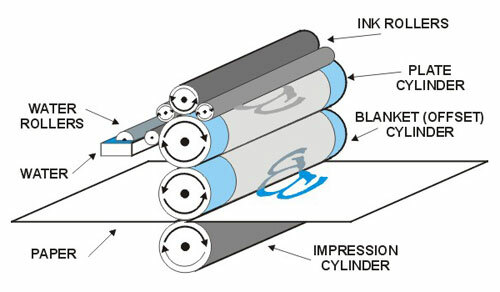 Iris printers use a continuous flow ink system to produce continuous-tone dot free output. Electric charges deflect unwanted micro-droplets into a waste system. 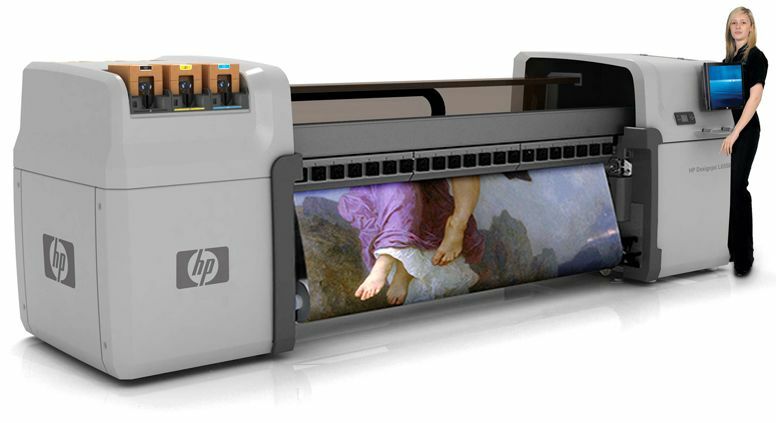 The Iris printer has now been superceded by Epson and other large-format printers that are cheaper and use archival inks. 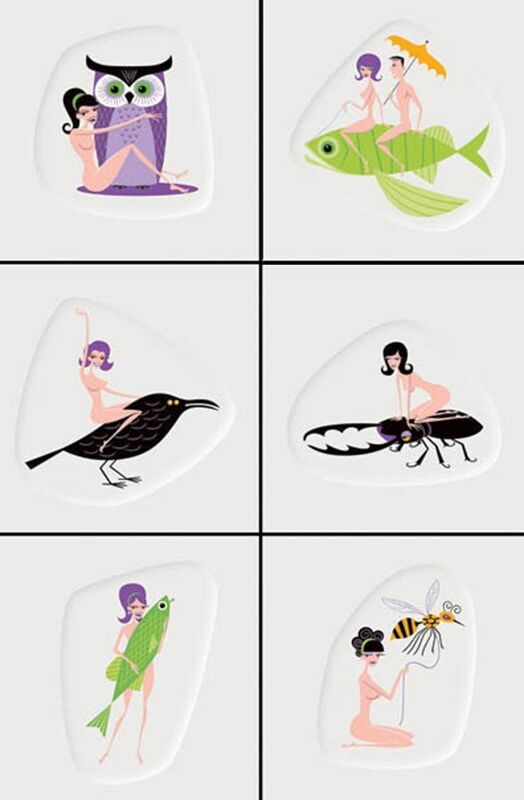 Giclées continued Shag’s fine inkjet reproduction following the four Iris prints (2004-2010). 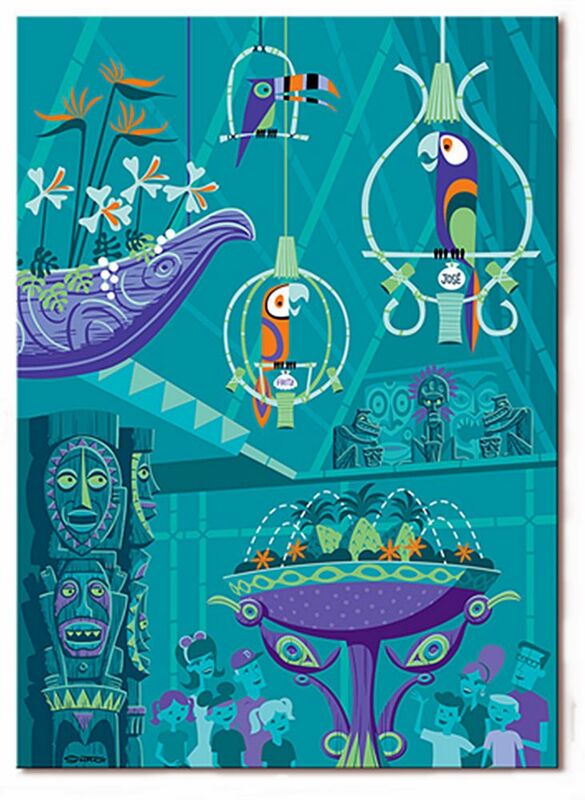 The first few works specifically identified as giclées were A Guide to Crypto-Hominids of the World (2010), and the Disney pieces – 40th Anniversary Map (2011), Tropical Hideaway (2013), and The Birds Sing (2013). 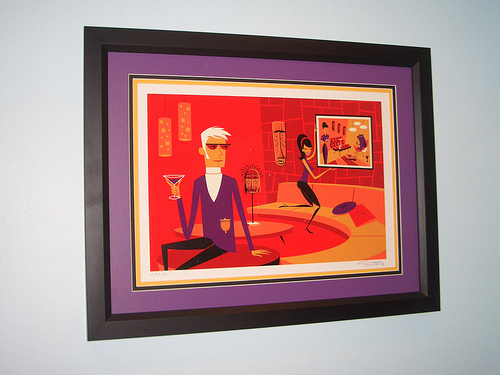 Many of Shag’s Disney prints are giclées. 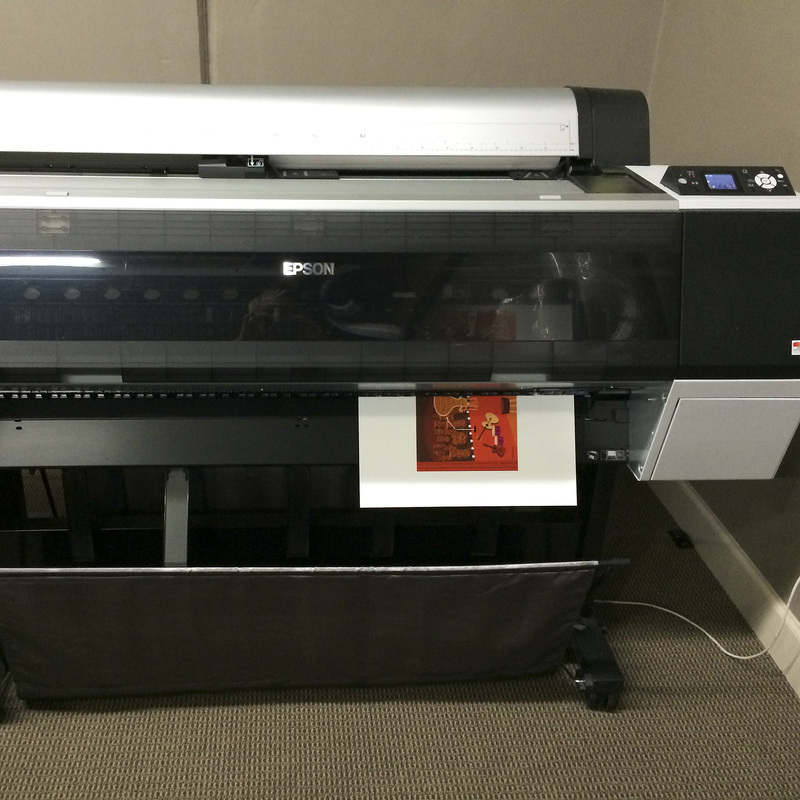 As an example to the media used, the Cirque du Soleil OVO giclée is printed on Epson enhanced matte 192gsm paper. Graham Nash was so impressed with the quality of Iris prints in a 1990 Crosby, Stills, and Nash photo exhibition that he purchased an Iris Graphics 3047 printer and later set up Nash Editions to digitally reproduce art. 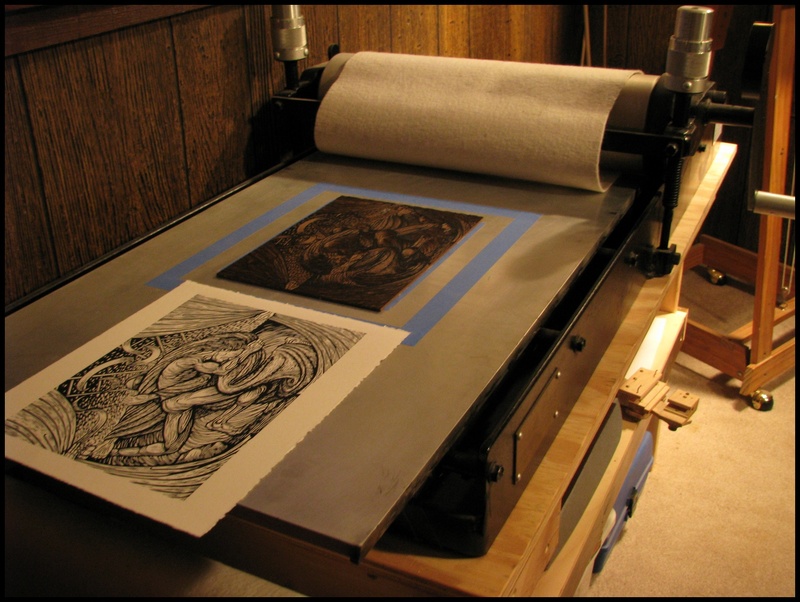 The company adapted the Iris printer for fine art reproduction by modifying the machines to take heavier paper stock and resolving issues with fading inks. Jack Duganne, a printmaker at Nash Editions, coined the term giclée to differentiate from industrial and home/office inkjet printing. 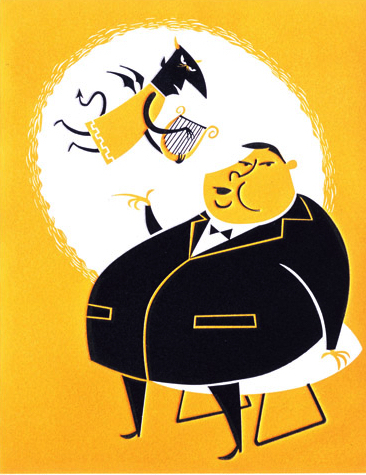 Similarly, Nash and Mac Holbert (manager of Nash Editions) coined the term digigraph for this type of print but this second term is seldom used. Each giclée is printed individually and offers the highest quality reproduction currently achievable. The term giclée, although originally for prints created on Iris printers, is used in a wider sense to mean those created using archival inks via a continuous flow inkjet process onto fine art paper. The prints produced are also called ‘pigment prints’ as the ink which contains miniature particles of pigment suspended in a neutral carrier liquid are laid down by a digital printer. The print head fires a fine mist of 64,000 to 165,000 droplets of pigment per second onto dense, heavy paper. 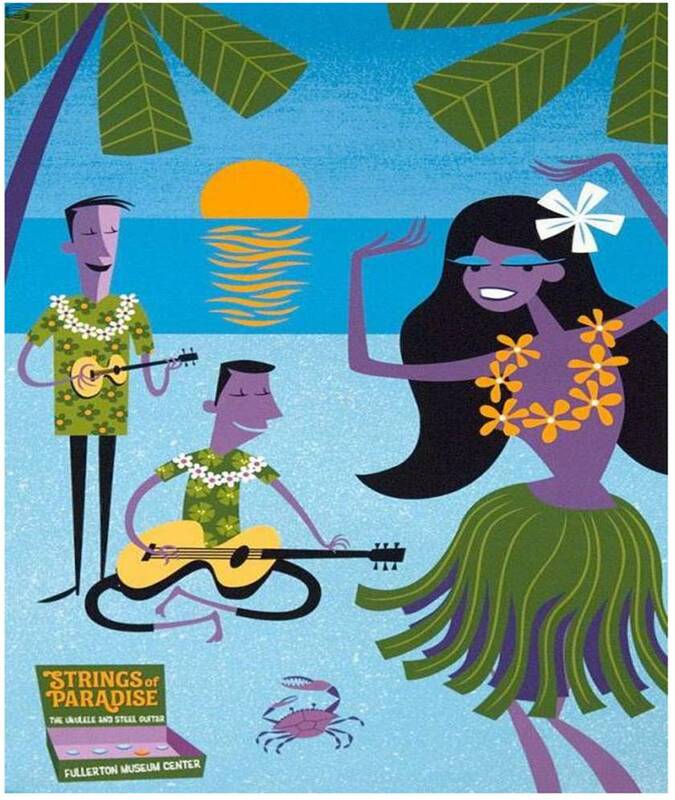 The 2014 limited edition Johnny Aloha “Lavapalooza” album jacket artwork giclée print can be seen being printed below left. 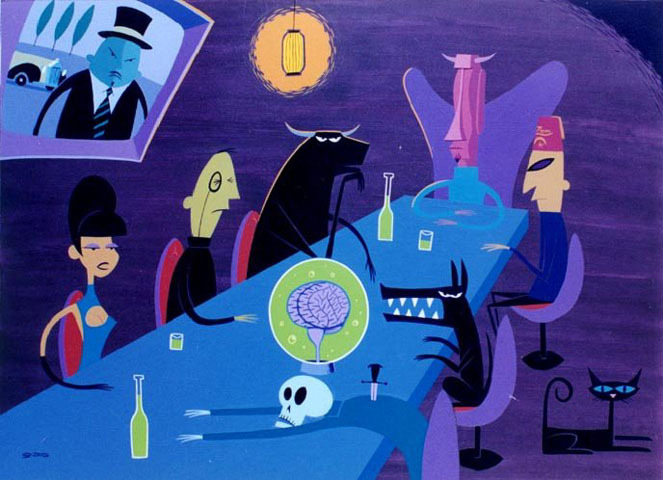 Most of Shag’s work is painted on prepared wood panels, the rest on canvas or heavyweight paper. Rag paper is made using cotton and is used as, unlike wood pulp-based paper, it lasts for years without deterioration and better absorbs ink or toner. Lastly, twelve prints for the Autumn’s Come Undone Exhibition were produced in Adobe Illustrator and produced as large-scale giclées on canvas. The 2004 Adam and Eve print from the Before the Eviction Exhibition was embossed with an impressive snake. The 2007 Flesh is Willing Exhibition series of six serigraph prints were more simply embossed. 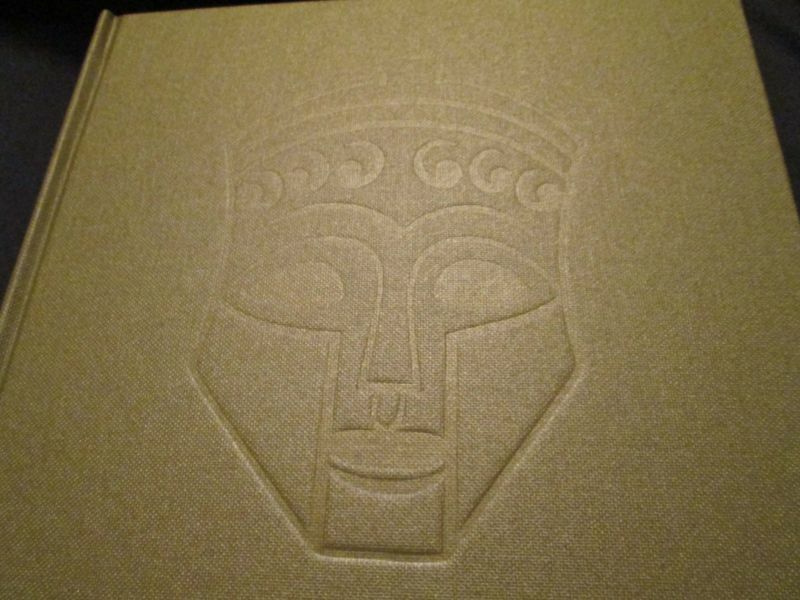 The two final embossed items were the hardback limited editions of the updated Supersonic Swingers book (foil embossed) and the Heroes & Monsters Exhibition book. 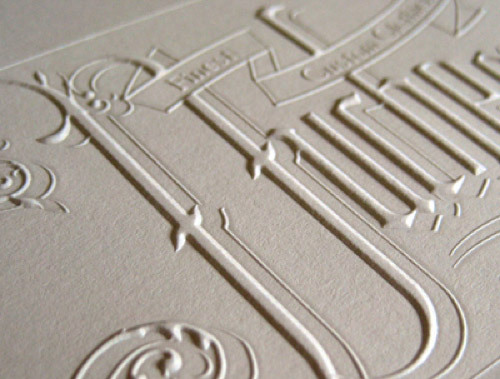 Embossing raises selected areas of paper or other materials to create a three-dimensional effect. The method provides a simple and cost-effective way of enhancing the surface of the target media. 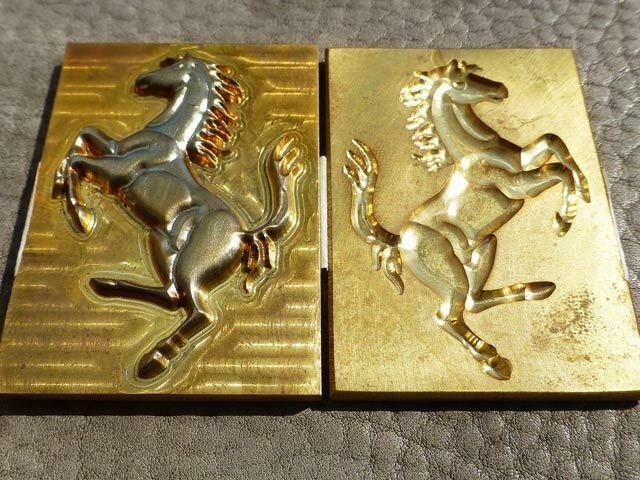 To emboss a material, it is pressed between two magnesium, copper or brass dies, one that is raised and one that is recessed. 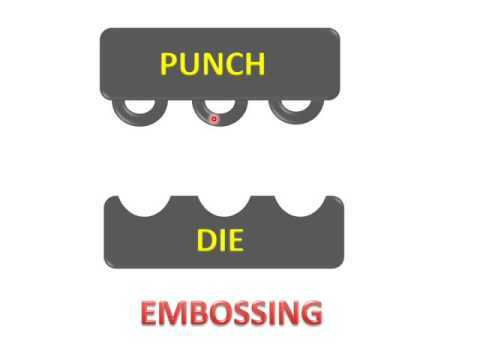 The raised die forces the paper stock into the recessed die and permanently creates raised areas. Foil embossing combines foil stamping (the application of a metallic foil or pigment) with embossing for a shiny 3D impression. An enhanced print is one that the artist has creatively and uniquely modified by hand, adding detail, depth or another variation. 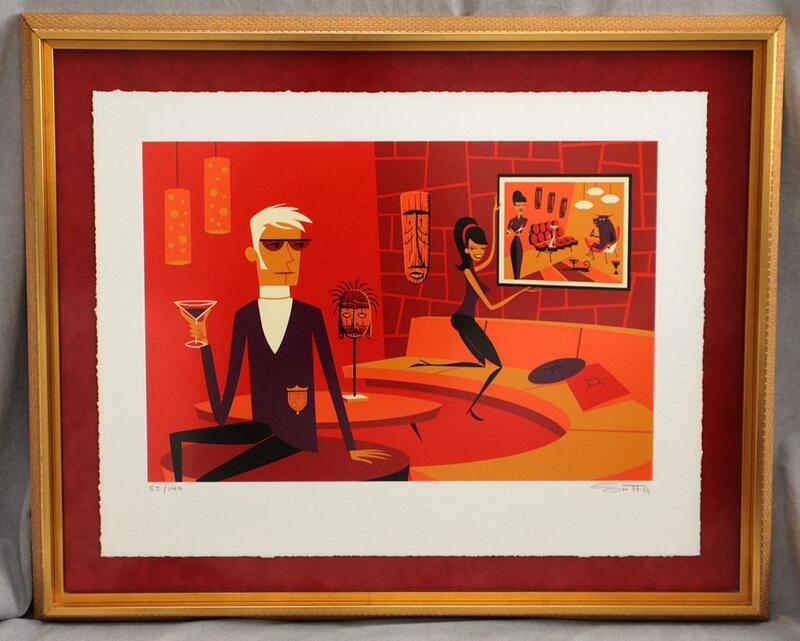 The only example by Josh Agle is the exclusive limited-edition print that accompanies the Phaedra Sculpture. 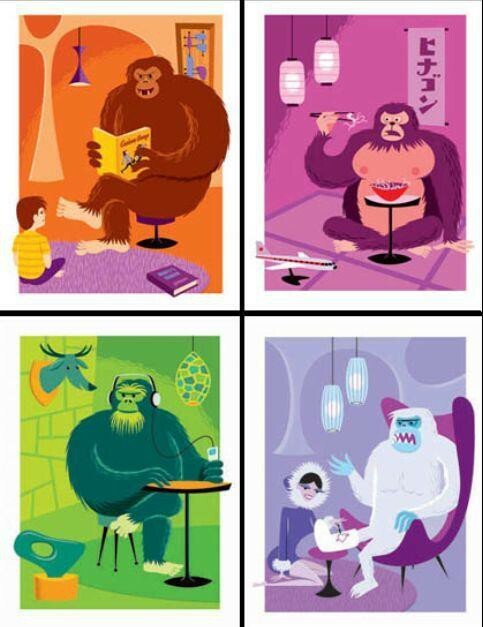 Shag drew a picture into the blank canvas on each print, effectively making new pieces of original art. The more specific name for this is a remarqued print which has a small original drawing or painting added to it by the artist. 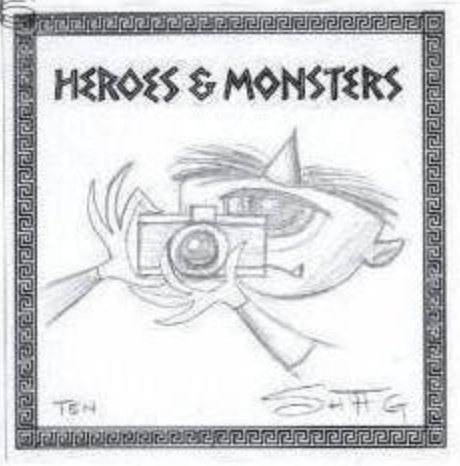 If you apply the term more loosely to include books then the limited-edition hardback of Heroes & Monsters: New Works by Shag contains a small original sketch, and the limited-edition hardback of Autumn’s Come Undone has a unique painting on each cover. 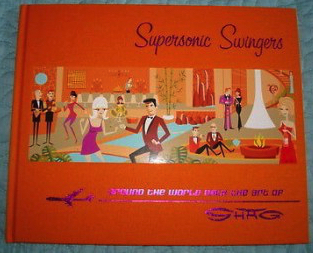 Many of Shag’s work has deckle edges, for example the 2005 print Well Hung (shown below as a print and “floated” in a frame) and the 2011 print Scooter People. 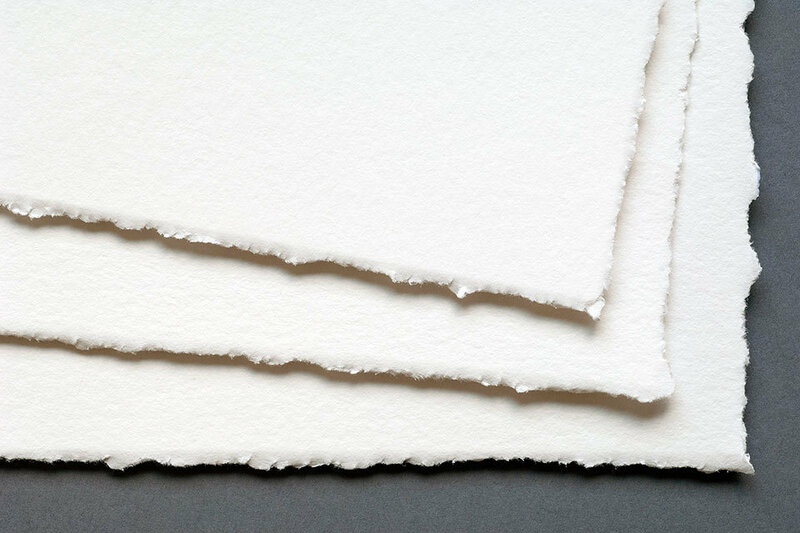 The manual papermaking leaves a ragged or feathered edge known as a deckle edge on the paper. The edge is often trimmed when the paper is cut to the final size but for decorative effect, this can be left untouched or even artificially added. 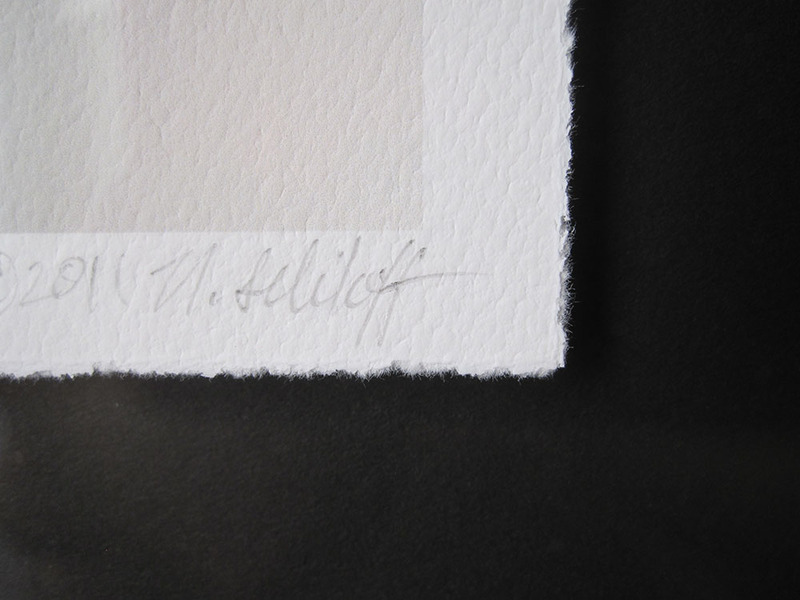 A controlled tear (often using a deckling tool) gives a rough, jagged edge so that the print can be “floated” when framed to leave the deckle edge visible. Hand deckled simply mean that the paper was torn to produce the rough edge. 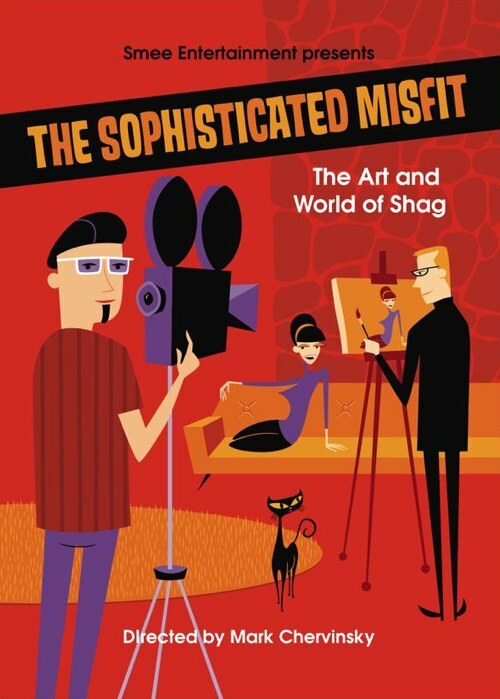 There is a excellent explanation of the serigraph printmaking process from master screen printer Jeff Wasserman of Wasserman Silk Screen Company in Santa Monica, California in Anatomy of a Print as part of the extras section on The Sophisticated Misfit DVD. 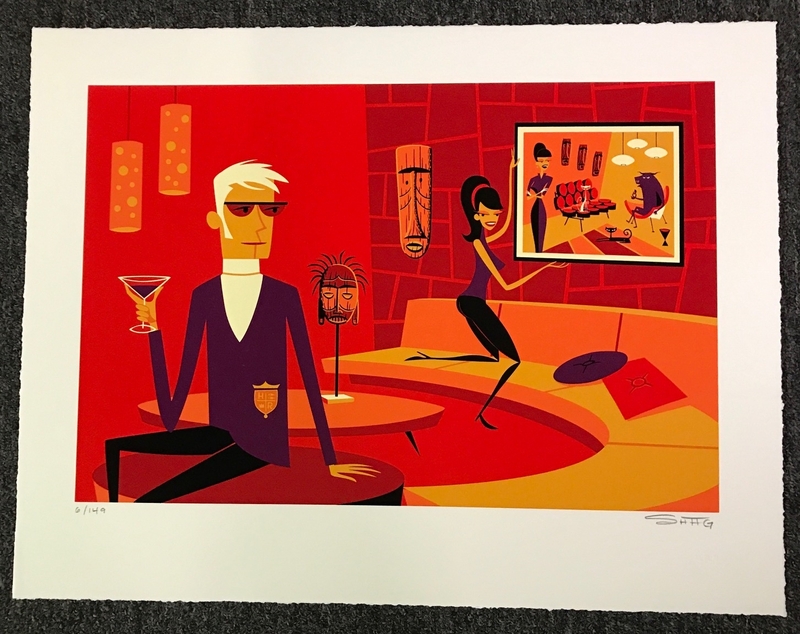 In the video he screen prints Well Hung (a 24″ by 20″ hand-pulled serigraph with oil based ink on high quality rag paper with deckled edges) in a limited edition of 150 prints just a few days before the 2005 Shag, LTD. Fine Art Limited Editions Exhibition. The printmaking processes developed over the centuries gives modern printmakers options when translating painting into limited editions. The continual digitization with the increasingly high quality of giclées prints combining archival inks and fine art paper moves more work away from traditional manual processes. See previous posts for the creative process and the numbering of limited edition prints. 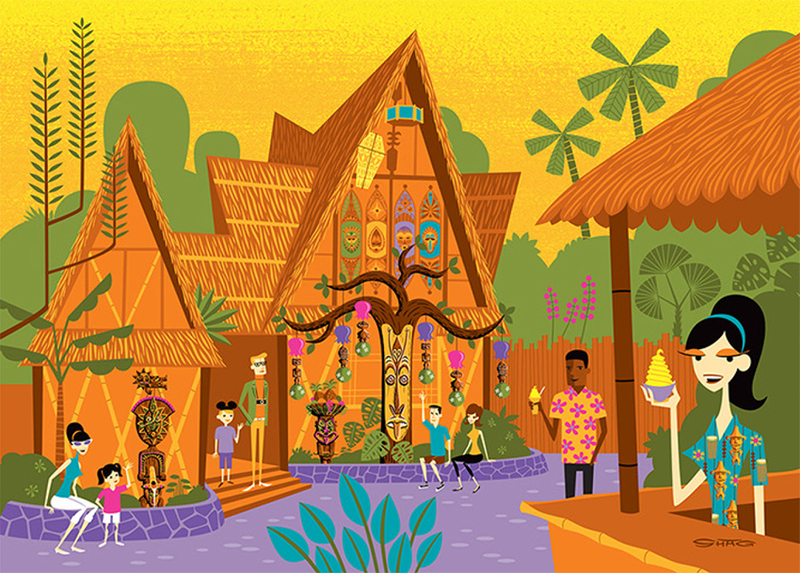 The latest Shag print as I write this post is the giclée On a Sunday Morning which measures a large 60” by 24¾” and was released at the 8th Anniversary Print & Print Release Party on Saturday 26th May 2018. The print retailed for US$699 up to the 28th May 2018 and US$799 afterward.